2017 marks our 50th anniversary and we’ll be celebrating throughout the year by sharing memories and achievements from our illustrious history. The Association of Liberal Councillors (ALC) was set up in the late 1960s and the Association of Social Democrat Councillors (ASDC) formed in the early 1980s. In 1988, the ALC and the ASDC merged to form the ALDC. Now in 2017, we mark the significant milestone: 50 years supporting Liberal Democrat councillors and campaigners. We are planning a number of exciting events and activities – we’ll be sharing more details soon. We will also be sharing various bits and pieces from our extensive archive throughout 2017 – photos, old publications, stories and other items of interest. We will use our website (a new 50th anniversary section coming soon) and our social media channels (Facebook Page, Facebook Group – Members Only, Twitter and Instagram) to share our archive findings on a weekly basis. 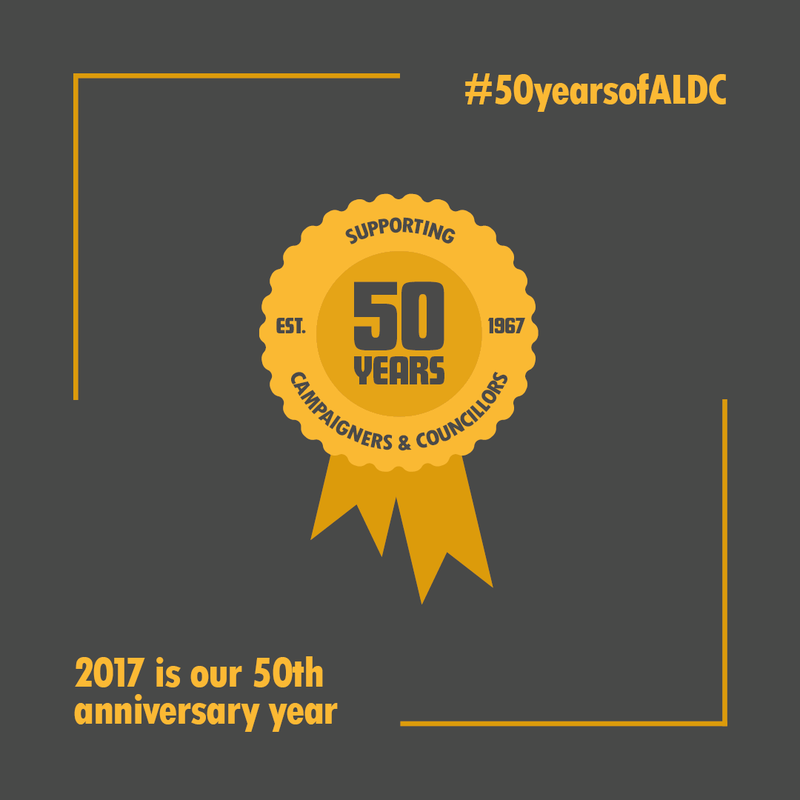 We want to celebrate the contribution that ALDC, our predecessor organisations, local campaigners and councillors have made to the Party’s success during the last 50 years. We need you to share your stories, anecdotes and vox pops; tell us what ALDC means to you. And if you’ve got any interesting old publications, resources or photos, let us see them too. You can share your stories, pictures and other content by adding them directly to social media, copying us in and using the hashtag #50yearsofALDC. Alternatively, email your content (and context) to us, and we’ll add it to our relevant social media channels and website on your behalf. Substantial papers from the ALC and the merger with ALDC are in the archive I provided to the National Liberal Club if anyone wants to have look. The classic A.L.C. Campaign Booklet Number 12 "The Theory and Practice of Community Politics" (1980) is accessible on the web at www.rosenstiel.co.uk/aldc/commpol.htm. There should be a link from this web site somewhere. Thanks Gordon. Are these archives electronic? If so, please email them to me: joe.mulvihill@aldc.org - I'll then take a look and share some of the content. Thanks Colin, the campaign booklet is already prepped to be shared soon - I appreciate the electronic link to it. I'll share the Standing Committee pic from '1999 though soon.